The Viceroy model in the Grand Estates by Courchene Development Corporationâjust sold. The beautiful residence features a traditional split floor plan with four bedrooms, four full baths, two half baths, a living room, dining room, and library that optimizes its 5,341-square-feet under-air layout. Like the other four models under construction in the Grand Estates, the Viceroy sits on a generous half-acre home site. Although the Viceroy has sold, Courchene is building two other models in the neighborhood. Highlights of the 4,925-square-foot under-air Savoy include an inspiring wine room, double doors leading to the outside from the VIP guest room, and an overall sense of serenity. The four-bedroom, five full and two half bath, Savoy also entices with its symmetry, as two, two-car garages flank the entryway. It is priced at $3,525,000 unfurnished. For buyers desiring even more space, there is Courcheneâs custom, two-story Bentley. 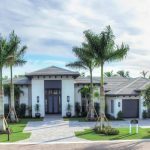 This magnificent model offers six bedrooms, six full baths, two half baths, a den, club room, loft, and a 4.5-car garage for the automobile enthusiast. The model overlooks the 17th hole of Old Palmâs spectacular Raymond Floyd-designed golf course, and views will be particularly sweeping from the second floor. The Bentley is available $4,895,000 unfurnished. The other two models being built in the Grand Estates neighborhood are by Hasey Construction. The Windsor is an extraordinary 5,138-square-feet under-air design offers four bedrooms, five full baths and one half bath in a great room plan. In addition, a separate office is situated toward the front of the home and a spacious club room lies off the great room. There is plenty of glass to bathe the interior in natural light, an easy transition between the indoors and outdoors, and generous proportions throughout.Â Overlooking a private water feature the Windsor is priced at $3,150,000 unfurnished. The other custom designed model by Hasey Construction overlooks a lake and the 17th hole of the Old Palm golf course. Â It features five bedrooms, six full baths and two half baths in 5,884-square-feet under air.Â In addition there is a separate club room and wine room.Â It is available at $3,900,000 unfurnished.